Her past can be forgotten but it's never gone. Can Mallory live with that? Mallory's life was changed forever the day she killed her boyfriend. Although she was spared from facing murder charges thanks to her lawyer's plea of self defence Mallory actually has very little memory of what happened that terrible night. Sent away to boarding school by her parents Mallory is hoping to put the past behind her but in a school where secrets are a highly valued commodity it is only a matter of time before the truth comes out. Even worse is the fact that someone or something seems out to get her, she hears voices in empty rooms, wakes up with mysterious injuries and feels like she is being followed. When another student is murdered Mallory's past makes her the most likely suspect but can she get to the bottom of what is really going on before anyone else is hurt? 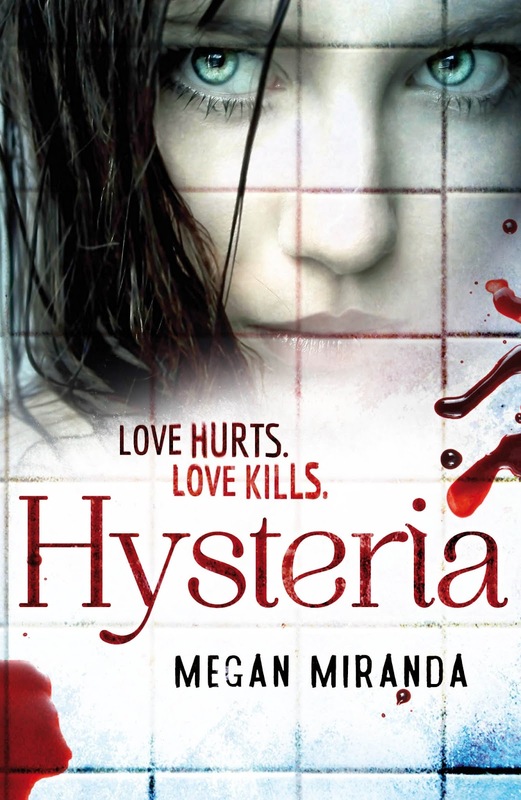 I absolutely loved Megan Miranda's debut novel Fracture so I couldn't wait to get my hands on her latest book Hysteria. Once again she has hit the spot and created a story that will grip you from the first page, a story with so many twists and turns that you will find yourself constantly questioning everything you have already been told. I love the way this author manages to write stories that almost have a paranormal feel to them but are at the same time firmly grounded in reality, both of her books have shown hints of what the human brain is capable of and I find that fascinating to read about. Mallory has hardly any memory of the night that she killed Brian and she really has no idea what happened between them or how he ended up dying from a stab wound. She is now constantly doubting herself and wondering if she could have done something differently to prevent his death. Distressed by what happened she is now convinced that Brian is haunting her so when the opportunity to leave home and go to boarding school comes up she jumps at the chance hoping to leave him behind. When the strange events follow her to school she starts to worry that she is actually losing her mind. Mallory finds it very difficult to trust anyone and doesn't know where to turn when things get out of control, her fear was very realistic and my heart went out to her. Since she has so many holes in her memory I found Mallory to be a very unreliable narrator, it was difficult to know whether she was telling the truth or recreating events in a way that made her feel better about what had happened. I went back and forth between being convinced that she was going crazy from the stress to thinking that someone was out to get her and worrying about her safety. I love a story that can tie me up in knots and make it impossible to guess how events are going to unfold and that is exactly what Hysteria did. I also really enjoyed the way the current timeline showing her life at boarding school was interspersed with flashbacks from the night of the murder. I was anxious to know what had happened that night but I was equally interested in finding out exactly what was going on at her school. Hysteria was another fantastic thrill ride of a story that I can't recommend highly enough. I can't wait to see what Megan Miranda comes up with next, she is definitely an author to watch out for! I really liked Mallory's unreliability too-kept me on my toes and flipping the pages. @ Bookworm1858 - This one really kept me on my toes too, I didn't have a clue what was going on until right at the end :o) I love books that can do that to me!